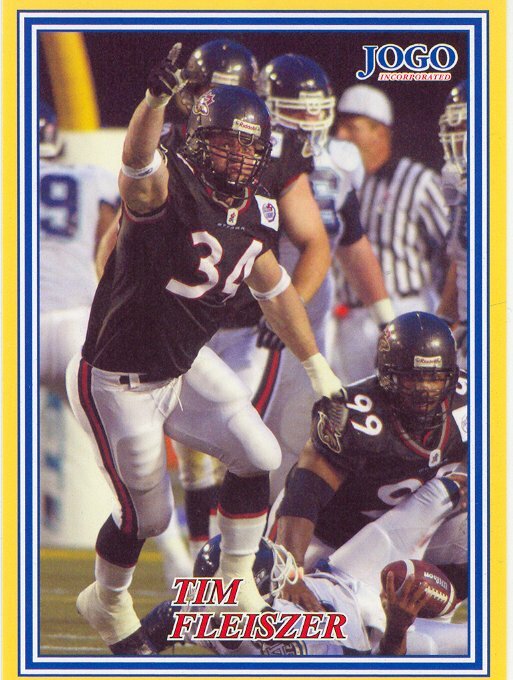 Tim Fleiszer was a first round pick and the first pick overall in the 1998 CFL College Draft by the Haimilton Tiger-Cats. In his rookie season, Fleiszer saw action mainly on special teams, but recorded 7 defensive tackles to go with his 14 special teams tackles. Fleiszer's prowess on special teams is a bit surpising as you don't often see many six foot three, 255 pound defensive lineman playing on special teams, backup or not. Fleiszer and the Tiger-Cats would go to the Grey Cup in 1998, but come up short against the Calgary Stampeders. In 1999, Fleiszer played in only one regualr season game, and was not in the line-up for the Tiger-Cats return to the Grey Cup which they won this time in a rematch with the Stamps. Fleiszer became a free agent for the 2000 season, signing with the Montreal Alouettes. Fleiszer played three seasons for the Larks (2000-02), and seeing more tme on defence, especially in 2001 when he recorded 21 defensive tackles. Fleiszer went to two Grey Cups with Montreal, losing in 2000, before finally getting to play on the winning side in the 2002 cup, Montreal released Fleiszer at the end of the 2002 season and he was signed by the expansion Ottawa Renegades. Fleiszer would play two seasons in the capital and set career marks with 18 special teams tackles in 2003 and 28 deensive tackles in 2004. Fleiszer also set a career high with four quarterback sacks in 2004. A free agent again after the 2004 season, Fleiszer signed with Edmonton for 2005 where he recorded 22 defensive tackles and 9 special teams tackles. Fleiszer also played in his fourth Grey Cup with Edmont, and his second win as the Eskimos beat Montreal, the team that had released him. Fleiezer moved to Saskatchewan in 2006 where he would spend his two last seasons, playing mainly in a backup role in a total of 10 games. 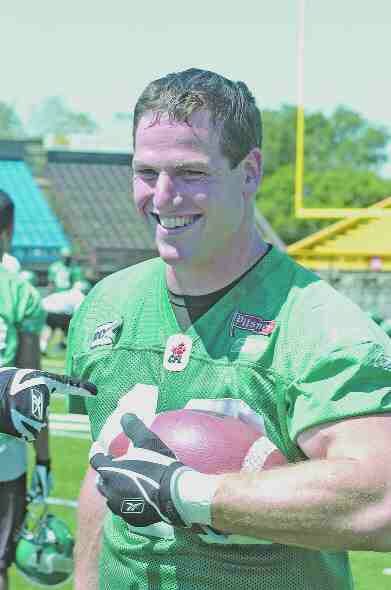 Fleiszer was with the Riders in 2007 when they won the Grey Cup, but didn't play in the cup final.